Product prices and availability are accurate as of 2019-04-18 02:39:32 EDT and are subject to change. Any price and availability information displayed on http://www.amazon.com/ at the time of purchase will apply to the purchase of this product. 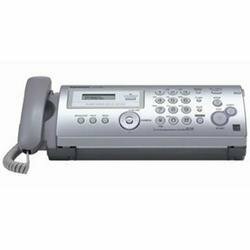 Automatic fax/phone switching distinguishes between fax and voice calls, eliminating the need for an extra phone line. 2-Line, 16-character LCD display allows you to see the name and number of your incoming callers. Navigator key lets you easily access menu operations like the phone directory and dialer, plus Caller ID memory. Automatic Document Feeder for optimum efficiency and convenience. Caller ID compatible so you can see who`s calling before answering. 20 broadcasting group locations. Print Technology: Thermal Transfer; Maximum Print Speed (Black): N/A; Maximum Print Speed (Color): N/A; Network Ready: No.